C.O.T.M December - Grant is the winner! C.O.T.M November - The winner is ammarbm! C.O.T.M November- Voting ends, it's a tie! C.O.T.M October - Dexter is the winner! C.O.T.M September - Boss Dave is the winner! C.O.T.M August - Honda Paul is the winner! C.O.T.M JUNE - The winner is Mikefoto! C.O.T.M MAY - The winner is Chandler! C.O.T.M APRIL - Phill1975 is the winner! C.O.T.M MARCH - Dinochips is the winner! 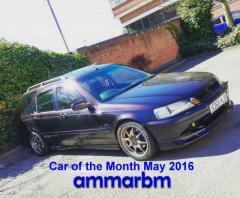 CAR OF THE MONTH FEBRUARY 2014 - Hubert's deck is the winner!